Once again John Wakabayashi led geologists and friends on an interesting fieldtrip through some of the most beautiful terrane of central California, Brewschist and Breweries (Brewschist II): A Tour of Fine Rocks and the West Coast Brewing Art Field Trip was a two day trip reprising The Golden B.E.A.R. 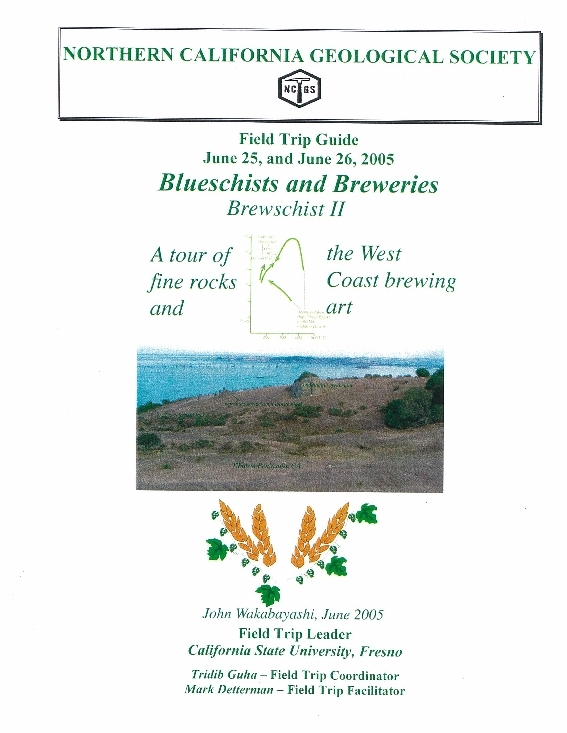 * Tour 2001 (Blueschists, Eclogites, Amphibolites and Refreshments) (brewpubs) in the Franciscan Complex of the central California. If you didn’t make either tour, you missed something special. 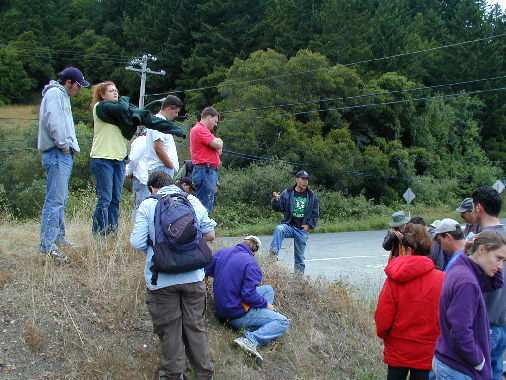 About 30 people came for the sites and tastes available from the spectacular Tiburon Peninsula to localities near Santa Rosa, Lake Sonoma, and Jenner. 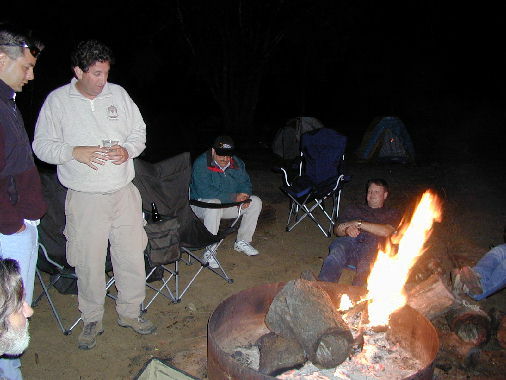 While the field guide discussed the importance of geology on flavoring local brews, John emphasized the necessity of drinking brew in order to fully comprehend the complex field relationships of these fascinating rocks. 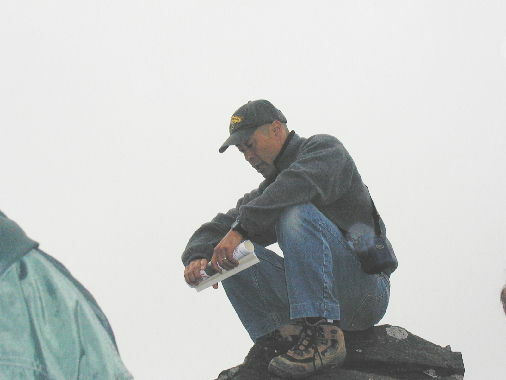 Wisely, John scheduled viewing and collecting stops at the first outcrops each morning, saving the more mundane outcrops and those most difficult to understand for study after appropriate refreshment. 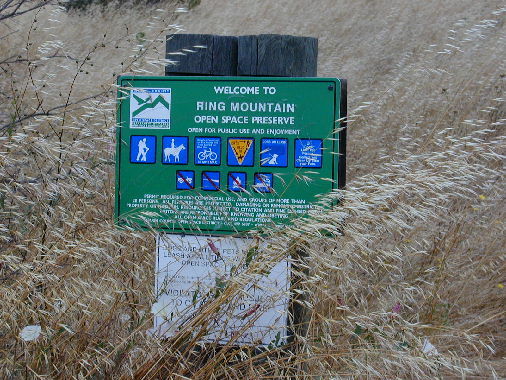 Saturday’s first stop on the Tiburon Peninsula Ring Mountain locality involved a quick, steep hike to breath- taking views overlooking the Bay. 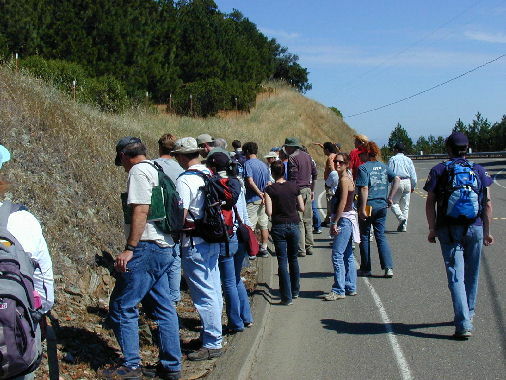 Non-Californians were ecstatic over the blueschists and eclogites, having previously seen these rocks only in the lab. 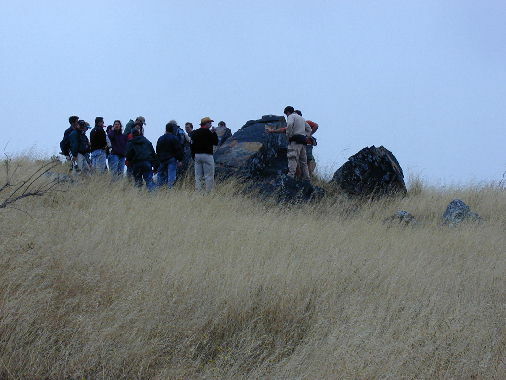 John gave a synopsis of the blueschist facies associations in the Franciscan complex, explaining how the rocks on this tour reflect unique aspects of the tectonic history of subduction in this region of California. He discussed two types of blueschists within the Franciscan Complex, each with different origin and history: relatively fine-grained “coherent” melange (metagraywackes, metashales, cherts, metabasalts, and serpentines, which constitute the basic mapable thrust sheets; and coarse- grained exotic blocks or “terranes” (metabasalts, metacherts), which represent garnet-amphibolite to granulite grade slabs that were later overprinted by blueschist to eclogite metamorphism. 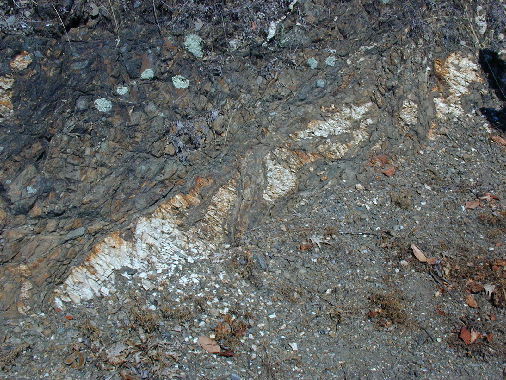 Blocks, frequently contained within melange, are particularly unusual because Franciscan blueschists are considered colder than most blueschist rocks; thus, any explanation of their origin must account for their original high temperature features. John pointed out that Tiburon “blocks” are notable for their unusual history of counterclockwise metamorphism: amphibolite à blueschist à prehnite-pumpellyite facies. Originally formed at high grade, the garnet-hornblende schists yield hornblende age-dates of ~160 Ma, recording a high temperature thermal event at that time. Apparently equivalent coarse-grained blocks elsewhere in the Franciscan (Pacheco Pass, Clear Lake) contain xenoliths up to granulite grade. The coarse-grained blocks everywhere yield radiometric age-dates marking a major thermal event ~160 Ma. Since these oldest metamorphic ages are only a hair younger than the Coast Range ophiolite, they likely record the first gasp of subduction. 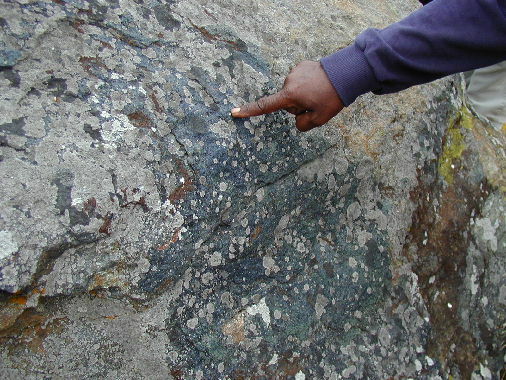 Bluish glaucophane and green omphacite rims on hornblende grains at the Tiburon outcrops record post-thermal blueschist metamorphism, indicating a “refrigeration” effect during subduction and after the initial thermal event. Wide ranging age-dates on white micas from the blueschists record a long period of blueschist metamorphism from ~158 Ma to 80 Ma. Lack of greenschist overprinting on these rocks suggests temperatures remained cool, perhaps due to continuous rather than episodic subduction. Hiking over the hill crest to examine more blocks of blueschist and eclogites, it was hard for some to not collect specimens from this fabulous nature preserve. 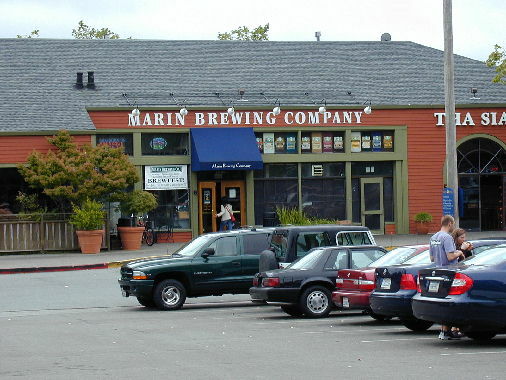 Fortunately, the sunny, cool, windy hilltop quickly drew thirst, so that the group headed back to the bus and on into Larkspur to the Marin Brewing Company. Comments on the brews are absent, as the person writing this wasn’t able to imbibe. 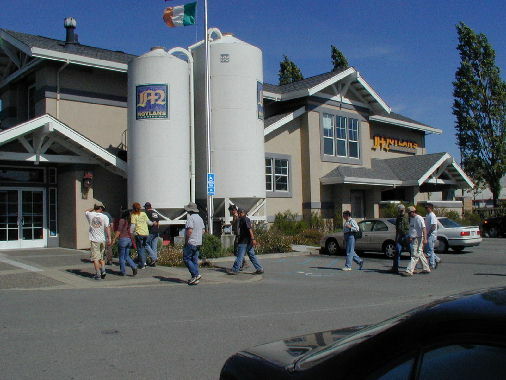 The first pub stop seemed designed to help folks sleep through a very long, slow drive along crowded 101 to Healdsburg. Following lunch at the Bear Republic Brewing Company, another long drive led to roadside outcrops of the Skaggs Spring Schist high above beautiful Lake Sonoma. In the beginning (150 to 160 Ma), eastward subduction occurred underneath a trapped piece of hot ocean crust, which later became the Coast Range Ophiolite. Initial subduction beneath hot, young ocean rocks overlying suboceanic mantle caused the subducting slab to heat to high temperatures resulting in metamorphism to amphibolite or granulite grade. Little sediment were associated with the young ocean crust, thus the earliest rocks subducted were likely basalts and cherts, which became heated to high grade due to residual heat from suboceanic mantle. As subduction continued, heat quickly dissipated so that a refrigeration effect controlled thermal regimes within the subduction zone. 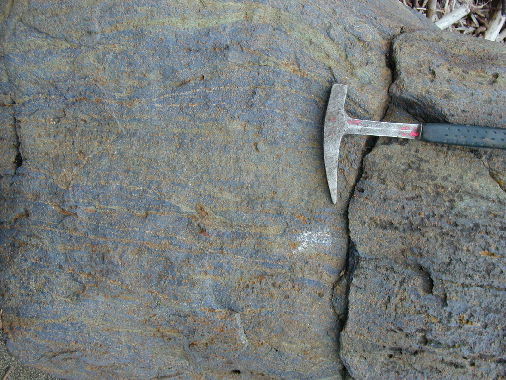 Refrigeration induced blueschist metamorphism at depth, overprinting the early-formed amphibolite rocks, which were later exhumed towards the surface. In time, graywackes, cherts and muds accumulated on the seafloor, which were dragged into the subduction zone and transformed into melange of the Franciscan coherent blueschist facies. 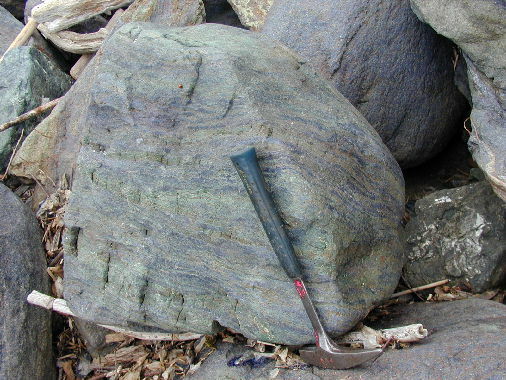 As subduction continued refrigeration prohibited heating of these rocks at depth, resulting in the development of the distinctive high pressure blueschist minerals (glauconite, lawsonite, jadeite) which give these rocks their unique character. John discussed several theories that have been proposed to explain how the high pressure (~30 km) rocks rose to the surface to become juxtaposed on low pressure (10 km) units. The high-P exotic blocks are widely assumed to move by diapirism along shales and serpentinites, or by sliding through melange channels. More difficult to explain is how relatively immobile coherent blueschist rocks moved to the surface. While field relationships show deep (30 km) blueschist rocks structurally superimposed on low pressure (10 km depth) rocks, perhaps more enigmatic is the absence of intervening units representing the 10 km to 30km facies. Since the high pressure rocks occur at all structural levels, any explanation of their origin must account for this apparent random distribution. Many of the blueschists occur within structural shear zones dated at ~90 Ma, related to uplift of the area. According to John, most previous studies of these rocks have focused on what happened to the blueschists after they got to their present positions. Thus John believes the problem of their origin has been incorrectly defined. “The Problem is: how do very deep rocks get up to the same locality as lower pressure rocks? how does an intact unit of high pressure rock get up to the surface? Rocks not down more than 10 km are directly on top of rocks that were metamorphosed at 30 km. What happened to rocks representing 10 km to 30 km depths?” An important (but not unique) aspect of the Franciscan is lack of any greenschist overprinting, which suggests that subduction was continuous rather than episodic. John proposes that the upward journey of blueschists from ~30 km deep occurred while subduction was active, although age-dates are still needed to better constrain the timing of structural deformation. John’s idea requires simultaneous movement along opposing structural thrusts above and below the blueschists, which may be brought to the surface by underplating on overlying, westward-moving thrusts. 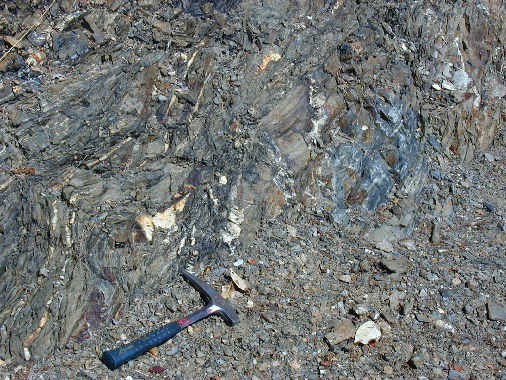 Simultaneous thrusting in opposite directions above and below the blueschists therefore provides a new mechanism to “extrude” deep material towards the surface. An important aspect of this model is that it can account for the absence of intermediate (10 to 20 km) metamorphics at the surface, without having to evoke massive erosion, as other models suggest. John’s model also precludes the need to explain absence of widespread ultramafics from the Franciscan, which would be expected if the rocks were pushed upwards by extension and normal faulting. 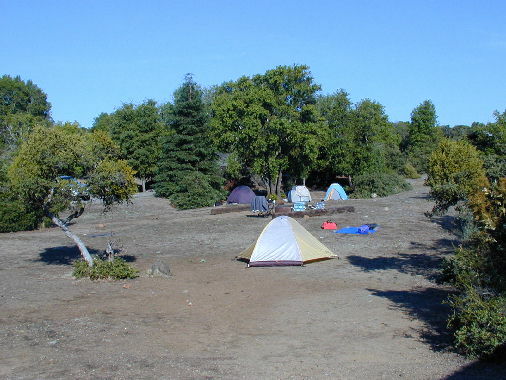 Perfect cool sleeping weather and an astounding banquet accompanied overnight camping at Spring Lake Campground in Santa Rosa. The generous efforts of Keil Albert and Ron Rubin resulted in a truly gourmet meal of barbecued chicken, hot dogs, garlic bread, potato salad, cookies plus an assortment of beverages. Following dessert (who had room for it? ), John broke out his private selection of homebrews for “The Brew Tasting Event.” Plenty of sipping was enjoyed by all. Sunday morning started strong with Phil Garbutt’s coffee, and pastries and fresh fruit. 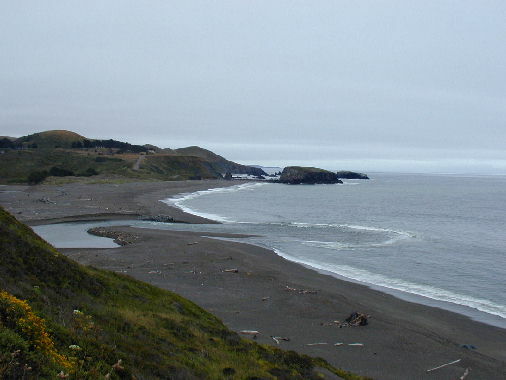 A relatively short drive through the winding Russian River Gorge led to Jenner, where the group scrambled down a seacliff to the shore, waking beach campers with the sound of rock hammers banging on exotic blocks. This stop was “The Crown Jewel” for most of us, being a place to actually collect specimens of these spectacular coarse-grained blueschists as well as sphene-bearing omphacite-garnet eclogites. Exotic blocks at this locality near Jenner lie within a structurally low melange zone, opposite the situation at Tiburon. 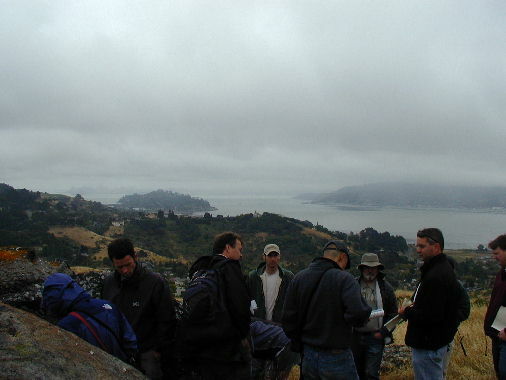 While some petrographic studies show the same counterclockwise P-T path preserved at Tiburon, there are additional, more complicated deformational and metamorphic crystallization events, which indicate a far more complex history. John cites studies that propose similar blocks may have been exhumed early on, eroded and resedimented into the trench, then later resubducted with the associated melange. 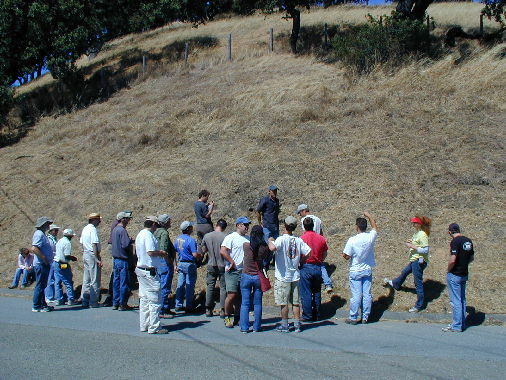 Following a short drive to Occidental, the group examined intact coherent blueschist facies rocks typical of Franciscan metabasalts. This outcrop probably correlates with undeformed blueschists near Ward Creek, At first glance these rocks appear to be simple metabasalts. Closer examination reveals thin purple-blue stringers, the only field evidence here of blueschist metamorphism. John reports that elsewhere, similar metabasalts contain pillow lavas with blue rims, where glaucophane developed in Na-rich reaction rinds that formed when the pillows originally erupted into seawater. 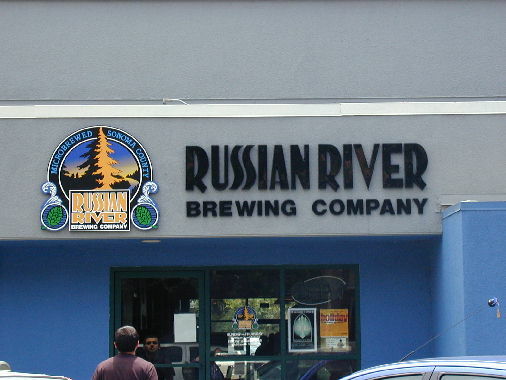 The Russian River Brewing Company, in downtown Santa Rosa renewed some of the energy sapped by rising temperatures. What began as a cool, breezy field excursion quickly turned warm and comfortable. Following lunch, a stop at the Atherton Road Exit near Novato completed the picture of the great variety of Franciscan blueschists. 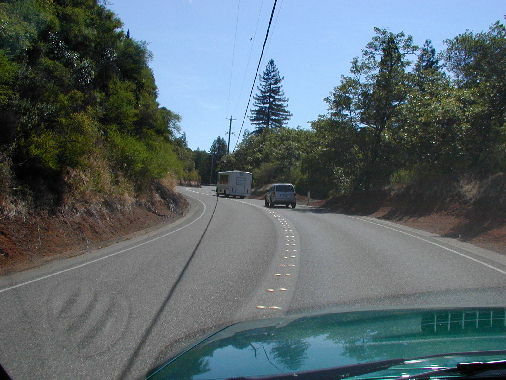 The Atherton outcrop shows coherent blueschist facies rocks that are representative of most of the Franciscan. Not very impressive in the field, most of these rocks retain a primarily sedimentary character. 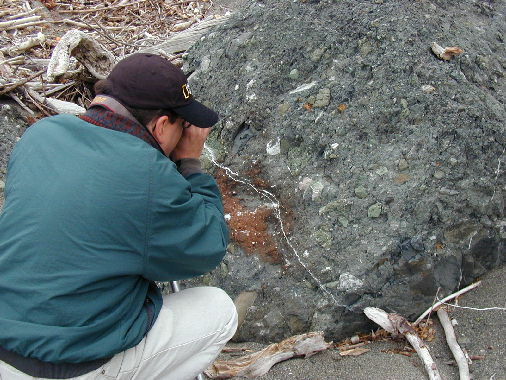 Standing by the road, the rocks appear to be ordinary sandstones, a weak metamorphic fabric is visible only in fresh samples, where radiating lawsonite crystals can be seen with a hand lens, thin sections show abundant jadeite pyroxenes, glaucophane and lawsonite. This locality typifies the majority of the Franciscan coherent blueschist facies, and underscores the necessity of careful field work on these rocks. When studying the Franciscan, it is imperative to recognize the signs of blueschist metamorphism on what, at first glance, may appear to be simple melange sequences. John notes: “most that is blueschist is not blue nor schist.” As temperatures rose, a final stop at Moylan’s Brewery in Novato was very conducive to a relaxing finish to a great weekend! The NCGS extends sincere thanks John Wakabayashi for putting together this dynamic field trip. Special thanks for the collection site at Jenner and for the thorough overview of a wide range of blueschist facies rocks. 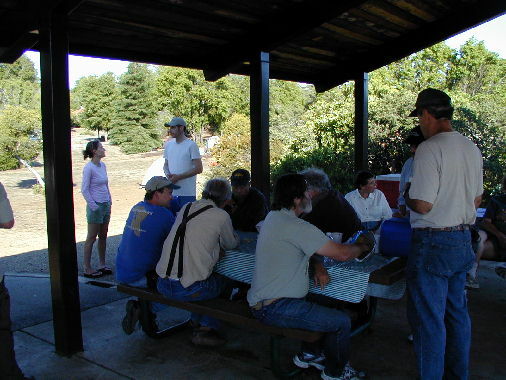 Kudos and thanks go to Keil Albert and Ron Rubin for an exceptional barbecue and to Tridib Guha, Phil Garbutt and Karel Detterman for the organizational assistance to the last minute field trip facilitator, Mark Detterman. In deed, organizational assistance from all participants helped this trip function with very few hitches!